My wife and I climbed Blue Ridge 3881' and Blue Ridge South Peak 3488' on Saturday. We parked at Pillsbury and approached via the Old Military Road. High up on the summit cone at approximately 3600' I noticed a flutter out of the corner of my eye. 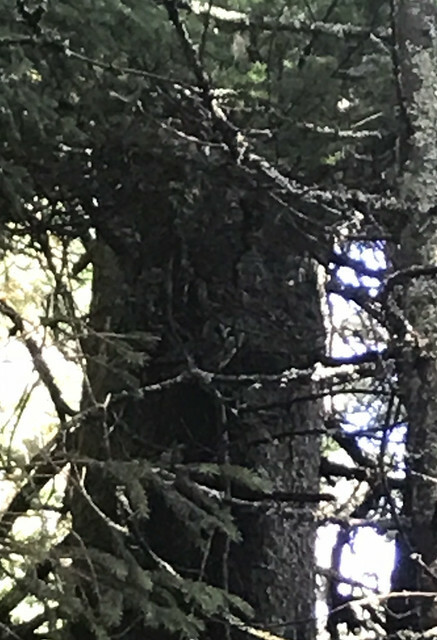 I looked to the right and nearly hidden in the trees was a Northern Saw Whet Owl. These types of owls are rarely seen but tend to not fly off upon being noticed like other types of Owls do. I took a photo of it in the tree (posted below, quite hard to see). Then it flew about 15 feet to another perch and I got a better close-up photo of it (also posted below). Such an awesome creature to encounter in the deep woods. Stunning and wonderful to see. The woods on Blue Ridge from the southwestern Stony Brook approach we took has to be some of the most spacious open high elevation woods in the Adirondacks, particularly nearer the top. The summit area has widely spaced out trees and little underbrush and blowdown. I found the old canister strapping at the summit which had an empty beer can stuffed in it. We took out the beer can and got rid of it. We then walked over to the steep edge and got incredible views over toward Indian Lake and Snowy. Perfect cool and sunny Fall weather. A fantastic hike, I would love to do this climb again! I've heard them dozens of times, but have never seen one. awesome! Saw whets are tiny little things. Surprised you saw it! Nice photos! I've heard them, and seen one once in North Hudson. Very cool little bird! How does one "get rid of" a beer can in an environmentally sound manner, except to pack it out and recycle it? McMartin's Guide for the Wakely Mountain trail speaks of all the Saw Whets up there, too. We hiked it, but did not see any in the thick woods near the summit. How does one "get rid of" a beer can in an environmentally sound manner? You grind it up into a powder and add it to your oatmeal one eighth of a teaspoon at a time. Late at night in the breeding season, males give a rhythmic tooting song that may go on for hours with scarcely a break. The bird was named for this song, which reminded settlers of the sound of a whetstone sharpening a saw. I saw one while entering Avalanche Pass, a few years ago. Like yours, it didn't seem alarmed at all, but stared curiously at me and another couple who went by. I think they're not seen more because they're very nocturnal, not because they're shy. That's cool! I never knew the origin of that name! Years ago a group I was with had an encounter with a saw-whet owl. Therefore four of us descending Pyramid at a pretty good clip (our knees were younger then) when the person in the lead came to an abrupt halt. The rest of us must have looked like a Keystone Kops routine as we bumped into the person in front, trying not to knock them down. What had stopped the leader was a saw-whet owl sitting on a small tree that was bent over the trail at just about eye level. Despite this unruly intrusion in the otherwise peaceful woods, the owl just sat therein blinked at us. My one encounter with a saw whet was similar to Tony's. I was with a group of students on a backpacking trip and acting as sweep. All of a sudden the lead person stopped and pointed to his left. Less than 10' away, sitting on some shrubbery was a saw whet. We must have taken over a hundred photos between everyone and it never moved a muscle. It was still there when we started hiking again but was gone later that afternoon when we went back to see it after making camp. I see Barred owls all the time in the Northeast. Has anyone seen a Great Horned Owl in the Adirondacks? Those are some elusive suckers. I have only seen 3 in my life anywhere. (and not in the ADKs). In 2005 there was a Great Gray Owl on an island outside of Montreal which I drove up to see. One of the most spectacular birds and it was like the size of Robert Wadlow. There is a group that nets migrating owls in the fall and bands them to learn more about their numbers and habits. 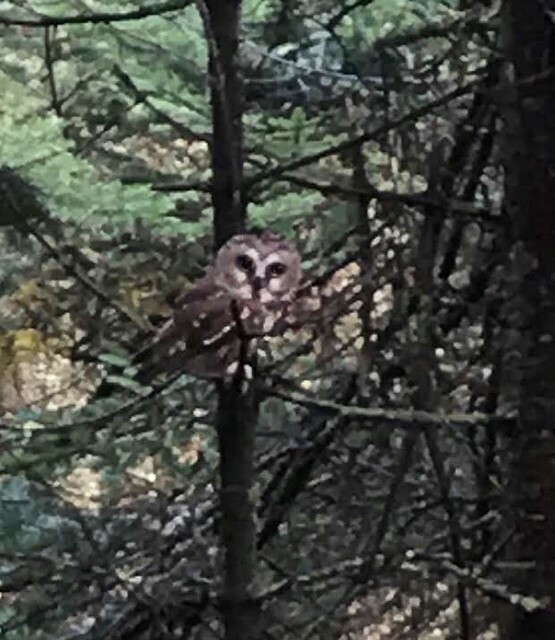 A guy in our area puts out the word each fall looking for assistants as he bands about 20 nights depending on the weather, last year he banded 137 owls (though the project is focused primarily on Northern Saw Whets, they also band other owls when they catch them). I WONDERED ABOUT YOU FOR A LONG TIME. THANKS FOR THE EXPLANATION. I saw a Great Horned several years ago on the Rock Pond outlet while going up from Little Tupper. They are formidable! I'd hate to try banding one (re other post) -- I've heard that the talons are so strong they'll go through a hand or forearm & be almost impossible to dislodge. Never seen a Great Gray. I'd love that! Ever been to VINS in Vermont? They have a raptor rehab center there, and they give a talk/walk and bring out a bunch of different birds for close up viewing. Worth a trip if you're ever in that area, especially in the warmer months when they have an outside demo and fly a Harrier hawk over the crowd at head level. I know they said a hawk's talons are "racheted" so once its talons close on you, it takes them little effort to keep them that way, but they are almost impossible for prey to dislodge. I wonder if an owl's are similar? Thanks for this. Not sure if it is the same organization, but there is a netting/banding station on the western tip of the island Montreal. They occasionally have open evenings where the public can watch the operation and learn about the species. I have some photos somewhere if anyone is interested. Always wanted to do this hike. Can you give specifics of your approach? I have climbed Pillsbury a dozen times, so familiar with military road. Would love to get to Blue Ridge summit and maybe the plane wreck as well. I know it is north of the summit proper. Saw one at Moose Pond on the NPT a few years back. Brave little guy, went and got my friend at the leanto to show him and he was still there when we got back a few minutes later.